SpaceX's Falcon 9 rocket sits on the pad, ready for the planned March 4, 2016 launch of the SES-9 communications satellite. SpaceX will try again to land the first stage of its Falcon 9 rocket on a robotic ship Friday (March 4), and you can watch all the spaceflight action live online. The rocket landing attempt will come during the launch of the SES-9 commercial communications satellite for SpaceX customer SES. 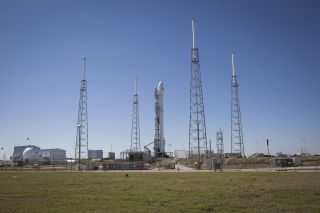 Liftoff will take place at about 6:40 p.m. EST (2340) Friday from Cape Canaveral Air Force Station in Florida; you can watch it live here at Space.com, courtesy of SpaceX. You can also watch the action live directly via SpaceX, at http://www.spacex.com/webcast or https://www.youtube.com/watch?v=Ml1RO4IcOG0. SpaceX has pushed the SES-9 launch back four separate times. Attempts on Feb. 24 and Feb. 25 were scrubbed because of issues involving the loading of liquid-oxygen propellant onto the Falcon 9, and a try on Sunday (Feb. 28) was aborted just as the rocket's engines began firing up, apparently because of rising oxygen temperatures — a situation that was partly attributable to a 35-minute delay caused by a boat in the launch's "keep-out zone," according to SpaceX founder and CEO Elon Musk. Another attempt was scheduled for Tuesday (March 1), but the weather didn't cooperate, according to Musk. "Pushing launch to Friday due to extreme high altitude wind shear. Hits like a sledgehammer when going up supersonic," Musk said Tuesday via his Twitter account, @elonmusk. If everything goes perfectly on Friday, the Falcon 9's first stage will separate about 2.5 minutes into flight. While the second stage carries SES-9 to geostationary transfer orbit (GTO), the first stage will perform a series of engine burns and come back for a vertical touchdown on "Of Course I Still Love You," one of SpaceX's two "autonomous spaceport drone ships," which will be stationed in the Atlantic Ocean several hundred miles off the Florida coast. But SES-9's journey to GTO will make the rocket landing difficult, SpaceX representatives said. "Given this mission's unique GTO profile, a successful landing is not expected," they wrote in an SES-9 mission overview. These landing maneuvers are part of SpaceX's effort to develop fully and rapidly reusable rockets — technology that could reduce the cost of spaceflight by a factor of 100, Musk has said.